The only weather system we didn’t have throughout the course of the weekend was a plague of locusts, and at some points it was like the disaster movie, The Day after Tomorrow; however as ever the plucky J24 class battled through with sense of humour intact and some cracking racing. Saturday morning, before we all left Parkstone Yacht Club a squall blew through with torrential rain. By the time we had got over the start line the wind had died completely and shifted 50 degrees and the race was abandoned. This pleased local boats, Chaotic and Madeleine who had both seen and gone for the non-existent gap at the committee boat end, causing them to fight for last place off the start-line, and up the first leg. The wind steadily increased to a good force 3-4, whilst David Lush and his committee re-set the course. 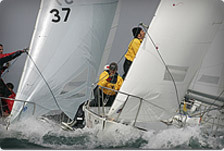 The fleet was evenly spread across the start line with one minute to go, with current European Champion, Andy Taylor and team in Phoenix; previous European Champion, Duncan McCarthy and team in Madeleine; and forever in third place, Nick Phillips and team in Chaotic; who all fought it out at the pin end. With only two rounds of the windward-leeward course, it was all to play for on the first beat, and Phoenix showed the fleet how to do it rounding the first mark and down to the spreader in first place. Madeleine and RWYC team, Nick McDonald in Cacoon were Just behind, with Andrew Hill in Wijit fighting off Matt Conyers in Unity Lets, with Roger Morris in Jolly Roger a few boat lengths behind. 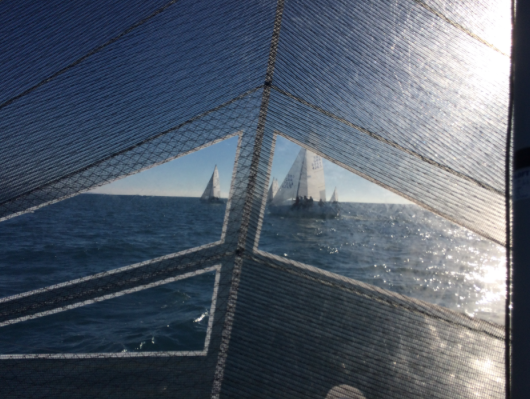 Somehow, Nick Phillips of Chaotic passed Cacoon on the downwind leg into third, which I cannot report how, as I was mainly under water, under a sail, or tying myself in knots for most the day. Before the class knew it race one was finished with Andy Taylor getting the first bullet of the day, followed by Chaotic in second (amazingly) and Madeleine just behind. The battle at the back was just as fierce with Quinton Hall and team on Jabulani putting up a good defence against Hijinks on the final round. The race committee went straight into the next sequence, with another close run battle at the pin end by the usual suspects with Taylor and McCarthy letting Phillips slip away with a clean start. Family Pollock, helmed by Alex Pollock had a stunning first beat living up to the boats name Flying Colours, in contrast to the previous race where is should have been called Flying Obscenities. They had a tremendous race coming in a strong third behind Madeleine and Phoenix or Phoenix Quantum which I have just noticed it’s now called. Those pesky kids on XP Rigging also had a blinder of a race sailing past Jolly Roger, Unit Lets, and Jawbreaker into fifth place. The wind was steadily increasing, and many had to make the choice between which head sail to use in the third race, with consideration to whether they would have time to change sail, and had they kept their foredeck in good spirits enough to do it? 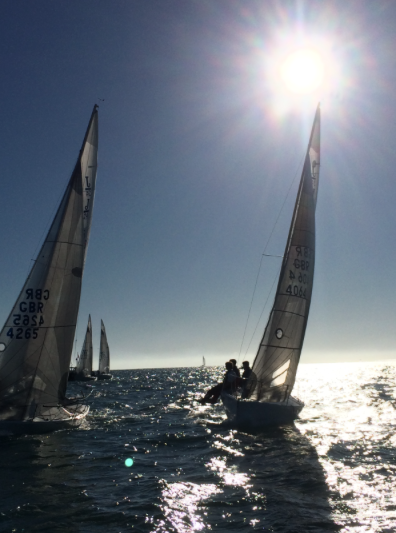 The race committee spiced things up in race four testing the crew’s mathematical ability adding a third leg. Sadly, for the Wolf of PYC, this was too much maths for Nick Phillips and in a close battle with Nick McDonald on not the final leg, they both went for the finish, letting Duncan McCarthy on Madeleine and Andy Taylor on Phoenix Quantum complete a third leg, along with Roger Morris on Jolly Roger all getting podium positions. Jobs for the Buoys and Wijit also had a good third race coming in 5th and 6th. By race four I was getting delusionary tired as the wind increased further, but thankfully most teams had a better level of fitness than I. Now down to only ten boats in the class due to breakages of boats and people, the competition was even hotter. Matt Conyers on Unity Lets found their feet and held off the rest of the fleet in forth position, whilst the top three battled it out for the top numbers as if working to a binary code. Gusts and waves had to be called back to the helm to keep pace up wind, as no one could let anything slip due to the closeness of the racing in true one design style. It was beyond a joke how tired I was by race 5 with deep thought to what other hobbies are out there being discussed on the rail. The day had reached survival conditions, and with memories of how many J24’s had found their way to the bottom of Poole Bay over the years, everyone had to keep their wits about them. Both European Champions, McCarthy and Taylor took this in their stride, and Unity Lets with their new found vigour from the previous race came in third, closely tailed by Nick McDonald and Team on Cacoon, and Family Pollock on Flying Colours who had been successfully quoting Top Gun on the downwind leg every time they caught a gust. Team Chaotic lived up to its name, Chinese gybing like pro’s down the last leg slipping and sliding into seventh position, followed by XP rigging and Miles Ushaw on Hijinks. That evening, kindly organised by Hannah McCarthy, a well-deserved curry was had by all at the Royal Motor Yacht Club, whilst Georgie Hepburn fleeced all competitors for raffle tickets for her deserved campaign. The fleet awoke he next morning to champagne racing weather; clear blue skies, a gentle breeze and flat seas. Due to the spring tides, the race committee sensibly started everyone early, and race one saw everyone bang on the start line on the gun. The sailors had to look for the wind lines, and Nick Phillips headed left, whilst a number of the fleet took the middle lane. Luckily for Phillips this paid and a safe distance was kept round the windward mark, with an exciting showing from David Cooper in Jaw Breaker in second place which he held to the finish. Nauseatingly Andy Taylor and team on Phoenix Quantum got their worst result of the regatta coming in third, followed by Madeleine. Never had the start been more crucial than on the penultimate race, with only one lap to make gains. Nick McDonald on Cacoon had a magnificent start, just behind Chaotic, who again took the left lane establishing a solid lead which they held to the finish, followed by Phoenix Quantum and Cacoon, and Madeleine. 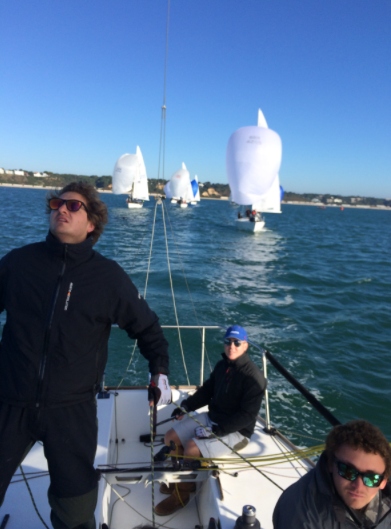 Further down the very close fleet, Andrew Hill on Wijit, Alex Pollock on Flying Colours and Matt Conyers on Unity Lets looked for the wind on the downwind leg, covering each other when they could. With the wind slowly dying the race committee went straight into the final sequence of the final race of the regatta, with an ambitious three lap course. Whatever Nick Phillips had eaten that morning worked, and Chaotic flew off the start line again, banged left and got every shift correct up the windward mark. Madeleine had a tough start and had to take the right hand side to find clear air along with family Pollock. Team Jolly Roger has a great first leg climbing into third place, with the Jacob Bennett and his young team on XP Rigging just behind, showing the older gang that they should watch out in the future for this team. Due to the patchy wind the fleet was quite spread out by the second downwind leg, and the fans were slowly dying out. The race committee sensibly saw the fleet doording down to the finish and shortened the course. Nick Phillips on Chaotic by now had a stunning lead on the fleet, however as they went through the gate the wind shut down completely, and the rest of the fleet sailed through. 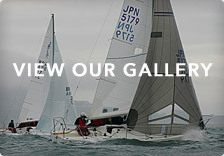 This certainly skewed everything, with Jawbreaker getting their second second of the regatta, Jolly Roger a third, XP Rigging a forth, however Andy Taylor and crew deservedly achieved their forth bullet of the regatta securing their win of the J24 Autumn Cup 2016, to add to the magnificent years they’ve had on the water. Many thanks to David Lush and his race committee for some great racing in difficult conditions, and to Parkstone Yacht Club for hosting us. See you all next year.